Care Well offers Laser Tattoo Removal in Delhi (South Delhi) at our cosmetic and skin center situated in CR Park. We are famous among our clients for quality skin treatments and care we provide. Call now for free consultation on how to get rid of unwanted tattoo on your body with the help of Laser. Laser Tattoo removal has become a craze amongst the youngsters and adults as well who wish to get rid of memories or are bored with their permanent tattoo. It has become very popular because they are easy and have very less side effects. The tattoo made with black ink is the one that can be removed easily with the help of high intensity laser beam. Colors other than black can also be removed, but with the help of alternative lasers based on pigment colours. In Delhi people usually prefer Laser tattoo removal such as passive laser tattoo removal, active laser tattoo removal, Q-switched alexandrite laser, Q-switched ruby laser removal and Q-switched Nd-YAG laser because they are easy and not so painful and the effect is lasting. Before knowing about the procedure of laser tattoo removal, let's first get to know about the preparation that is required before undergoing laser tattoo removal. First of all you must fix an appointment with an experienced dermatologist surgeon so that you can discuss about your aspirations, medical history, health issues and other ongoing medications. He will also conduct a physical examination, so that the dermatologist can guide you properly. Aspirin and anti-inflammatory medicines must be avoided before the treatment. Every tattoo has its own uniqueness and thus the number of sessions may vary from person to person and tattoo to tattoo. The number of sessions for laser tattoo removal depends upon the age, size, location, and color of the tattoo along with depth of ink in the skin. 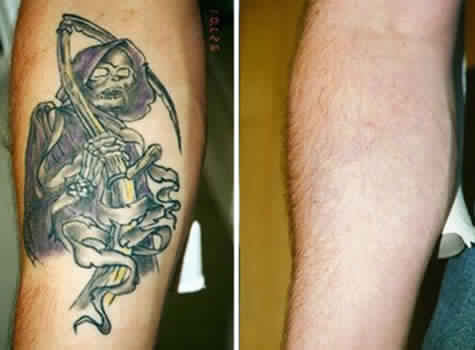 10 to 30 sessions may be required for complete removal of a tattoo with the help of lasers. People usually ask questions like, whether this treatment gives permanent results or it is just a temporary wrapping up of tattoo. We guarantee that this treatment provides you 100% permanent results. Once the tattoo is gone means it is not going to appear again. The body's natural filtering system eliminates the tattoos completely though it may take some time and repeated procedures. After every treatment session, ice pack must be applied to the treated area. After the Laser tattoo removal Session there are chances that you may experience some sort of bruises.. The treated area must be kept clean for healing up and avoiding infection using ointment that is prescribed by the Dermatologist. The area must also be covered up properly using a patch or bandage until it heals completely. Last but not the least, you must not scrub the treated area and neither expose to the sunlight for its proper recovery. Laser tattoo removal in Delhi at Care Well is dedicated towards providing the best facilities and treatment to the clients and customers that come to us.